So what’s the quintessential visual representation of fish in Japanese culture? Is it a decorative koi, swimming gracefully in a garden pond? Or is it a delectable piece of sushi sitting atop an elegant piece of tableware? Maybe it’s both, like these sushi morsels that combine five staples of the popular dish into a beautiful piece of edible art! 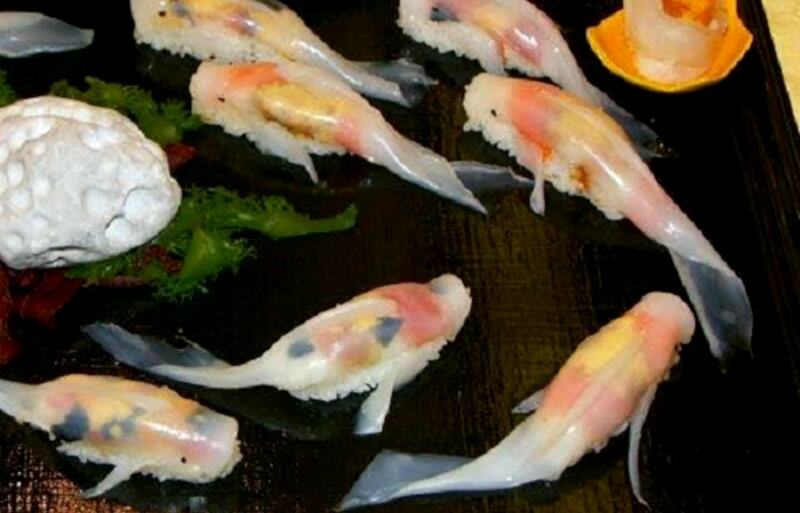 While that might look like colorful koi gracing a serving tray, they’re actually pieces of nigiri sushi. Pressed atop the blocks of rice are strips of salmon, uni (sea urchin) and egg, along with a few flecks of nori seaweed. The whole thing is covered with an extra-thin slice of translucent squid, cut to form a tail and fins, and two more dots of nori for the eyes. While this such a mix of ingredients alone would be considered luxuriously decadent in Japan, what really got people talking was the amazingly lifelike look these "koi." The koi-shaped sushi is officially called the Nishikigoi no Sugatazushi (“Multicolored Koi-Shaped Sushi”), and can be ordered for ¥2,250 in sets of three from Nishikizushi, a sushi shop that’s based in Oita Prefecture’s Saiki City but delivers nationwide. Just remember, though, that the Nishikigoi no Sugatazushi is indeed food, and resist the urge to try putting one in your aquarium and keeping it as a pet.